In the world today, hope is a priceless commodity. You can give hope by making a gift to CKRH today to enable those with challenges to work on being the best they can be. Your contribution directly supports our programming and operations. No matter the size of your gift, you will be impacting those we serve and allowing our programs to continually evolve and expand. There are many ways to help strengthen CKRH’s sustainability for our future. The only question is deciding which is the best fit for you. Many of our clients and their families are burdened with healthcare expenses. CKRH proudly subsidizes each participant’s fee to keep their cost down. But we need your help to continue meeting the growing demand for our services. We provide more than 14,000 direct client service hours annually! A monthly donation plan is a great way to help us maintain this level of service. Best of all, your gift will be easily deducted from your bank account without any hassle on your part. The Clark Family Foundation Maintenance Fund is a newly established endowment to fund annual routine repairs and improvements to our facility. You can help build this endowment or other endowment priorities by making a major gift. 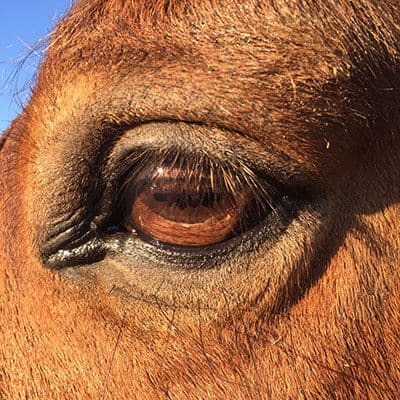 Join our new Legacy Society for those who plan to ensure tomorrow’s generations have the same opportunities of experiencing our quality equine-assisted therapeutic programs. Planned Giving includes but is not limited to gifts of bequests, retirement plans and life insurance. Please contact us about choosing the best option for you. Operating a farm and therapeutic center such as CKRH takes a lot of different horse care products and business materials. Our wish list includes the items we are currently needing and would greatly appreciate receiving. Whether it’s your birthday, a holiday or just for fun, hosting a party is a fabulous way to raise money for your favorite charity– CKRH! Simply invite your guest list to make donations to CKRH. This can be gifts of funding or an item from our Wish List. Support CKRH while doing your regular shopping! Simply register your Kroger Plus card, Rite Aid wellness+ with Plenti card and Amazon Smile account and select Central Kentucky Riding for Hope as your charity of choice. Links are provided below. Socialization is important to all ages. Whether it be with a person or an animal, time spent in the company of another being can help bring peace, calmness and a sense of security. 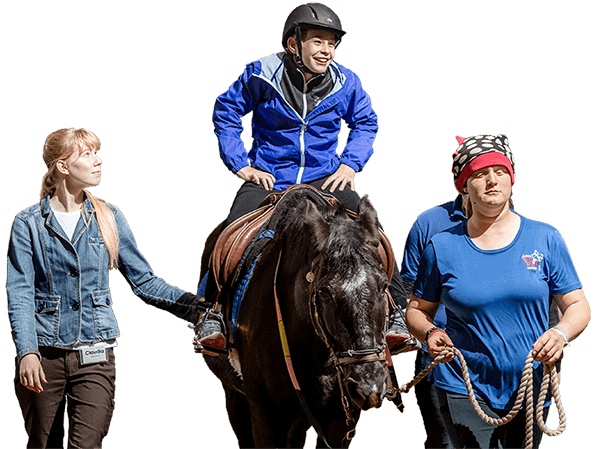 Strong bonds are created at CKRH by participants with their horses, volunteers and instructors. Additionally, friendships can grow between the participants who attend weekly lessons together or even at one of our yearly events. Such was the case for Tina and Mary Ellen during NIGHT OF THE STARS. Socialization is important to all ages. Whether it be with a person or an animal, time spent in the company of another being can help bring peace, calmness and a sense of security. Strong bonds are created at CKRH by participants with their horses, volunteers and instructors. Additionally, friendships can grow between the participants who attend weekly lessons together or even at one of our yearly events. Such was the case for Tina and Mary Ellen during NIGHT OF THE STARS. Last year was Mary Ellen’s first time to ride in front of an audience! The 14-year- old is homeschooled so socialization is an important factor of her therapy plan. 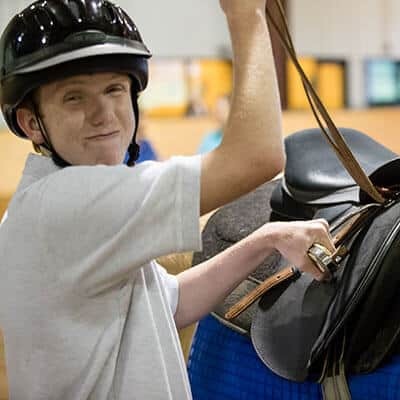 Diagnosed with cerebral palsy, Therapeutic Riding helps improve Mary Ellen’s balance and ankle strength. She rides with an adaptive left-hand glove that has Velcro to help hold the rein. She was a bit nervous prior to the big night as she was unsure what to expect. Tina, an 18-year- old who was born with a chromosome disorder, is a seasoned performer who debuted at the 2015 gala and competed in the 2016 Special Olympics. She was able to take Mary Ellen under her wing, and the two became fast friends. The mentor/mentee friendship carries a high impact at all ages and situations. At CKRH, we see every day how these extraordinary relationships directly impact the success of our program and the achievement of personal goals.